Phenylethyl alcohol agar (PEA) is a selective medium used to cultivate Gram positive organisms. The active ingredient, phenylethyl alcohol, inhibits or markedly reduces growth of Gram negative organisms by interfering with DNA synthesis. 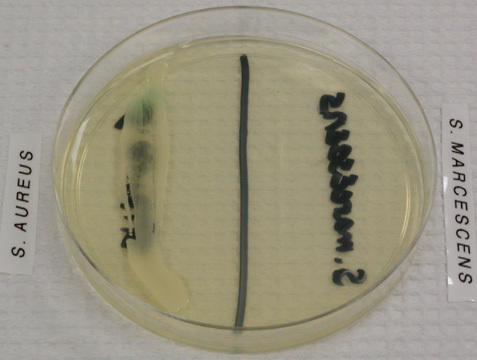 PEA also prevents Proteus species from swarming across the surface of the agar. Staphylococcus aureus, a Gram positive organism, grows on this PEA plate while Serratia marcescens, a Gram negative organism, does not.